Experience peace, bliss and calm during this weekend yoga and meditation getaway staying in the heart of nature less than an hour from Perth. Delve deep into the higher, quieter and mystical practices of yoga. Includes meditative bush walks, sound healing, agni hotra, swimming in sacred waters (in warmer months), and beautiful, nourishing vegetarian food. Every now and then we need to retreat from the busyness of our lives to delve deep into the heart, the mind and the soul. An immersive yoga retreat with a focus on the higher limbs of raja yoga and advaita vedanta - the yoga of 'oneness' and connection. Also included is hatha yoga, nature walks, forest meditations, agni hotra, sound healing and nourishing, delicious foods for a holistic, revitalising, restorative and truly transformative weekend. Samyama is the practice and experience of the higher limbs of yoga: dharana, dhyana and samadhi (steadiness of mind, sustained concentration and the resulting peace) merged together resulting in powerfully insightful meditation where we come to 'know' the true nature of that which we meditate upon. ​We identify and unravel the inner obstacles through self-enquiry (vichara) and satsang, gaining the space and clarity to discern the higher truths and awaken to the usually inaccessible stages and states of spiritual consciousness (samadhi). The result...understanding, awareness, acceptance, peace, bliss, purpose. Facilitated by Robert & Mandy - knowledgeable and caring teachers who have practiced and taught yoga and meditation most of their lives, after years of guidance from their own teachers in the traditional ashrams of India. ​This is a profound opportunity to deepen your knowledge of yoga and its underlying philosophies, and to experience the beauty and gifts of the subtler, less commonly taught practices of Yoga. lovely retreat centre less than an hour from most places in Perth. Cost: $545 shared room, $495 camping, $445 non-residential. Meditation is amazing - we literally peel away the layers of illusion to reveal the majesty and beauty, the creativity and insight of the true self. In all our seeking, striving and all our doing, we forget that perfect knowledge and insight are cultivated through being still and are found within. Even yoga is something we 'do', yet is also the state we desire to attain. It is through Samyama that the meditator becomes the meditation, the dancer become the dance, the subtle form of that which we meditate upon is revealed to us. 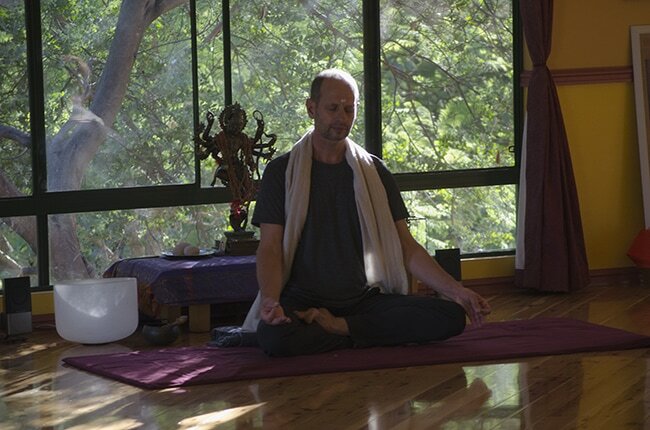 Retreats are an opprtunity to live and experience the yogic lifestyle. Sivananda's traditional hatha yoga is comprised of 5 distinct points which together comprise a balanced and holistic system of self-care and self-awareness. On this retreat we include proper exercise (yoga asana); proper breathing (pranayama); proper relaxation (yoga nidra); proper thinking (meditation); proper diet and lifestyle (sattvic/peaceful food, time in nature). When practiced with sincerity and integrated into everyday life and everyday thinking, traditional yoga perfectly and effortlessly brings balance and harmony to the 5 aspects of self: the body, breath, mind/emotions, wisdom and soul. While the other limbs (asana, pranayama, pratyahara) work to purify the body, prana and the senses, dharana, dhyana and samadhi purify the mind, thoughts and emotions. To be in samyama is to be in a state where you have perfect control over the mind. In this state, the ideas and beliefs we think are true are revealed as illusory, fleeting & disproportionately important. This process of shedding illusion eventually reveals the divine self - and this first glimpse, our first experience of samadhi, even if it is momentary, can be electrifying and life-changing. It is through diligence and continuing practice that we integrate insights in a meaningful and authentic way. Spacious shared bedrooms with either 2, 3 or 4 beds. Fresh, beautiful linen. Living closely to nature brings us into harmony with both the external environment and our inner nature, enabling an intuitive understanding of what is needed to rebalance and bring healing to the body, mind and soul. On this retreat we meditate within and upon nature, including the sun, the moon and the trees. Kookaburra Yoga's integrated system of Hatha and Raja Yoga is holistic and beneficial on every level of being. Asanas are of 2 types (both rejuventative/uplifting and restorative/calming) imbued with 4 qualities: those which bring inner quiet; those which bring focus and body awareness; those which bring humility and detachment; and those which increase confidence and vitality. We establish a rhythm and routine which bring immediate calmness to the body, mind and soul. The schedule for your days and evenings is taken care of, allowing you to relax deeply, immersing yourself in the program and the retreat process. You'll relax to the sounds of the forest. We unplug from technology for the weekend. By all means bring a book (paper), camera, and provide loved ones with our landline (9399 1000) for emergencies. With our focus consciously tuned to experience the present moment, the natural world and our own inner nature we are able to begin the recovery and reintegration of our fragmented attention. Many people come to a retreat for rest and respite. We have allowed time in the program for the rest you need and reflection. Our wide verandahs overlooking the creek and forest with comfortable chairs and hammocks are the perfect place to read, write or reflect. You'll have the time and the opportunity to get to know and share with others. We have some lovely big common areas to relax and mingle. This is balanced with extended periods of mouna where we keep company with others while maintaining a respectful silence to enable each other to go deeply into the meditation and retreat processes. Agni Hotra is a purifying vedic fire ceremony performed exactly at sunset and sunrise. The ceremony, which includes burning cow dung and chanting mantras, is purfying and cleansing to both the environment and to participants. The Havan is a longer and more complex fire ritual sometimes included if the weather is permitting. A beautiful sound journey with guest sound healer Nicole Lloyd who uses sacred instruments including large gongs, crystal bowls, the flute and koshi chimes to transport you to a blissful state where deep healing, integration and soul connection occur. The sounds nourish and nurture, bringing calmness to the nervous system enabling a deep and true relaxation experience. On retreat we leave behind concerns and distractions to deeply and profoundly realise the spiritual and material benefits of yoga, returning to our lives with renewed energy and focus. We deepen the gratitude in our hearts for both the joys and sorrows of our lives. Both are a gift of love leading us beyond duality to the graceful, limitless centre of ourselves. Food on this retreat is sattvic - meaning it brings peace and enhances the wellbeing of the body, mind and spirit. All food is plant-based, predominantly organic with much of the produce grown locally. Cuisine is vegetarian and gluten-free, and is sustainable, pure and real. Vegan options for all dishes. Robert has taught yoga and inspired many students over almost 4 decades here in Australia, and also India, Africa and Europe. Robert is a humble teacher, his yoga is deeply spiritual and real and he is committed to sharing and passing forward the insights and knowledge he has acquired. Robert has a Masters in Psychiatric Social Work, having worked in the field for many years, and is a professional and skilful group facilitator and spiritual guide. Mandy has decades of experience teaching the subtle, powerful and transformational methods of yoga. Her knowledge and insights have been inspired through devotion, consistent practice, higher education in yoga, Ayurveda, the arts, and integration of yogic values and concepts into everyday family and professional life. Mandy makes traditional, spiritual yoga practical, relevant and accessible. "The four day Yoga retreat was the most peaceful, insightful and healing experience I've ever had. The shared accommodation was comfortable and vegetarian meals were absolutely fabulous; home made exquisitely prepared cousins. The days were fully scheduled with yoga, meditation, bush walks, healing fire ceremonies and many more soul nurturing activities. Mandy and Robert are remarkably skilled in all aspects of Yoga and share their knowledge with love and attentivness. I am very grateful for such a wonderful retreat, set in a beautiful pocket of green bush environment." "Sincere heartfelt gratitude to Mandy, Robert, and your beautiful family and friends for such a blissful weekend; words don't seem to do it justice. The Retreat was precisely what I needed at precisely the right moment. And the food was mouth-wateringly delicious each and every love-filled meal! I would highly recommend this to anyone seeking to soothe the soul, tune in to nature, self, and a joyful community that feels like home..."
"It is very rare to find such authenticity and purity in teachers such as Mandy & Robert. I am so grateful to have been taught by them not only in the practice of yoga but all the other elements that make a yogi. Thank you for offerings your lives to this teaching and helping to heal this world." "Never have been to such an amazing and peaceful venue with the most knowledgeable and kind instructors. Thank you for introducing me to this beautiful form of self love." "I thought the retreat was just simply beautiful and inspiring. I was inspired by the food which you made. My journey over my stay was extremely nourishing and I felt so safe and secure.Thank you both for your warm generosity and for being so inspiring and sharing the beautiful practices. As I have said before when I am going to spend a day at Kookaburra I always feel as if I am coming home to a safe and beautiful space." Stay in your own tent. 2 nights stay in shared room. Shared bathroom. Full use of facilities and venue during program. Camp using your own tent and bedding. Full use of facilities and venue. 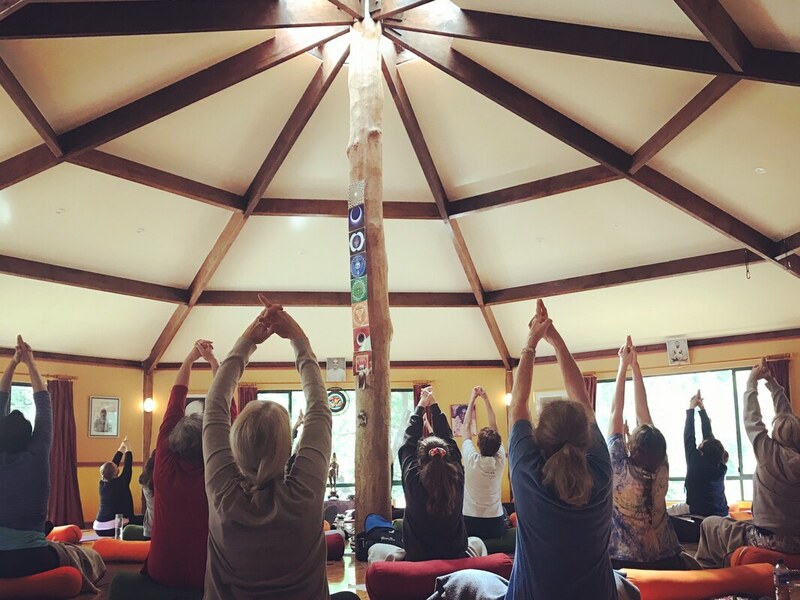 Why choose Kookaburra Yoga for your retreat? Established, reputable business. Kookaburra Creek Yoga Centre is directed by experienced teachers Robert Becker and Mandy BeckerKnox in Perth, Australia. Kookaburra Creek Yoga is well established having been operating for twenty years. Health & Safety. Our venue is maintained to a high standard to support the health and wellbeing of participants. We take every precaution to ensure the hygiene and health of participants. Value for money. Retreats are fully inclusive with everything included in the cost. There are no additional costs and there are no items or services offered for sale during the retreat. Socially responsible. We care for people and the planet. All our retreats cause as little harm as possible. We are an entirely vegetarian venue. No, we welcome anyone who is interested in embarking upon a journey of self enquiry and discovery. The yoga and meditation practices on each retreat are carefully explained and taught in a caring and respectful manner. All of the practices taught can be adapted to suit the needs of each participant. ​WHAT ARE THE VENUE DETAILS? Kookaburra Creek Yoga Centre is a purpose-built yoga centre in Bedfordale in the Perth hills with capacity and equipment for 30 students. The centre is set on 10 acres of bushland and is quiet and serene. The residential retreat facility is nearby with accommodation for 10 participants. On the property is a renovated railway carriage (accommodation for 2). The grounds and facilities are also suitable for those who may wish to camp in their own tent. ​If you cancel 0-1 week before the retreat the full amount of the retreat is payable. If you cancel more than 1 week before the retreat the full amount minus $50 administration fee will be refunded to you. ​If we have a waitlist and can fill your place from this, all money paid will be refunded to you regardless of when you cancel. You should be fine to attend if you are in reasonable health. Please check with your own health care provider if you have any concerns or doubts. If you get sick during the retreat, an after hours locum doctor (bulk billed) can be called or you can attend the Armadale Hospital Emergency Department (24 hours emergency) which is 5 minutes by car. ​WHAT IS THE RETREAT SIZE? If you require a payment plan to pay in 2 instalments please be in touch to pay in two instalments.